Don’t you just hate having all of those bulk drinks you purchased from Costco sitting in the hot pantry and not being ice cold when you want one? What about those family gatherings when you run out of space in your kitchen refrigerator? You’ve been thinking about buying a garage refrigerator but you just aren’t sure which one will work? Will they be too expensive or break down due to the heat? Let me stop you there. We love our garage refrigerator. It gets so much use and stores so many drinks the neighborhood kids call our garage the Jiffy Mart. It was one of the best decisions we have made since moving into this house 5 years ago. 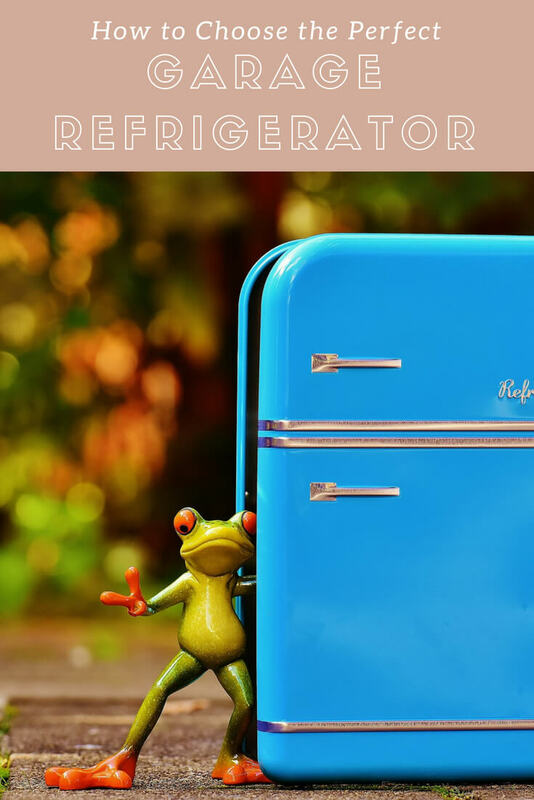 I’ll help you find the perfect garage fridge in this article and calm your fears about expense or maintenance. Can you keep a refrigerator in the garage? Yes. Refrigerators work fine in garage conditions. If you live in an extreme climate you may need to make a few modifications to your setup to increase the lifespan of your garage refrigerator. Can you keep a refrigerator in a hot garage? Yes. I live in the south where the temperatures stay in the 90s throughout the summer. My garage’s average daytime temperature is 95 degrees Fahrenheit. Can you keep your freezer in the garage? You can keep either a combo refrigerator/freezer or a deep freezer (chest freezer) in the garage. Some manufacturers sell “garage-ready” refrigerators which have a few differences from the regular models. These can include extra insulation, higher energy efficiency, and a lower range of recommended operating temperatures. Can a freezer be in a cold garage? This depends on how cold we are talking about. Check the recommended operating range to see what the manufacturer suggests. If your garage gets cooler than that for an extended period of time, you may need to purchase a garage kit for the freezer so it will run into lower temperature ranges. The average lower operating temperature of a normal freezer is 59 degrees Fahrenheit. Does hot weather affect refrigerators? Purchase an energy efficient model. Insulate your garage if you can. Only open the fridge when necessary. Store gallon jugs of water in empty spaces to help regulate the temperature. What is a garage kit for a refrigerator? A refrigerator garage kit is a small coil that warms the air around the refrigerator’s thermostat. In cooler weather, this will fool the refrigerator into keeping the compressor running more often than it would. Shown is a model from Frigidaire. Before deciding on whether or not you want to purchase a refrigerator for your garage, take a look at both the benefits and potential negatives of having an extra refrigerator. Once you weigh both sides of the issue, you can better decide what is the best route to take. Here are a few of the benefits and drawbacks of having a refrigerator in your garage. Ease of finding what you need–no digging! 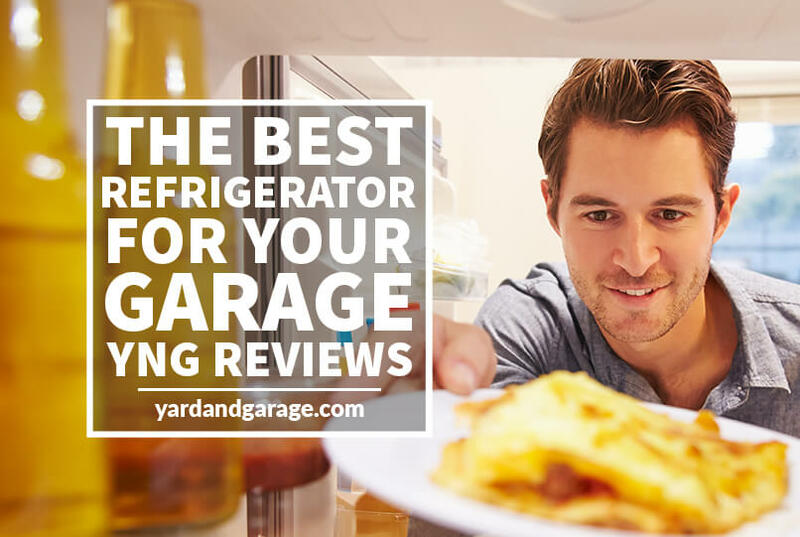 Now that you’ve scanned through the positives and negatives of owning a second refrigerator, here are a few reviews on some selected refrigerators, in varying sizes and capacities, which could possibly wind up in your garage. Frigidaire’s frost-free refrigerator’s larger capacity enable it to be installed from box to garage with limited effort and no added adaptations. The previous champion, the Kenmore 61215 with garage ready technology, has been sold out for a few months. It is basically a slightly smaller mondel than this one and with a built in heater (Only necessary in extremely cold areas). This refrigerator is really good in garages as it can fit into snug spaces. It is over 5 feet in height (68.25 inches), measures 30.25 x 34 inches and weighs 220 pounds. Its top freezer is frost free for easy care and the freezer capacity is 5.1 cubic feet, which is fairly substantial for this size refrigerator. The freezer has an optional ice maker (probably not needed in the garage) and there is only a single evaporator unit. The interior of the refrigerator contains LED efficient lighting, four adjustable pullout shelves, which are split to accommodate space for varying containers and food and drink items. There are two clear crisper bins at the bottom of the refrigerator as well as an upper meat/deli bin that keeps fish, meat and cold sandwich deli meats at around 32 degrees. The lower side door, which can be reversed, has an interior area where storage consists of a long and narrow bin area along the bottom of the door as well as a larger open storage bin area above it that can accommodate gallon capacity containers. There is also a self-contained covered butter/margarine container above the other storage spaces. The upper freezer side door has two long clear storage spaces for frozen juice cans and other narrow frozen food items. This refrigerator is energy efficient, although it is not Energy Star Certified. It has an estimated yearly energy cost of $52, which, of course, hinges on current utility rates of the local area. The refrigerator comes with a User Manual and there is a limited Frigidaire Warranty, with proof of sale/purchase, for one year from the date of purchase for material or workmanship defects. Look for the Energy Star or ES rating on any refrigerator that is going to be used in a garage area. This particular Frigidaire model is both quiet and effective at cooling at high and lower altitudes, in and out of a garage. It is extremely efficient in its ability to adjust to the temperature of the area in which it is placed. Its inner lighting function is substantial and allows for easy retrieval late at night. Though this automatic defrost Danby model is more of a compact or smaller, freestanding refrigerator, it can be placed in a garage for easy access to food, drinks, and snacks. It has a Spotless stainless steel exterior door finish, a 4.4 cubic feet capacity, has a 120V power outlet, weighs 75 pounds and measures 21.1 x 20.7 x 33.1 inches. The interior of the refrigerator contains three adjustable and sturdy shelves that vary in width as well as a bottom pull out hydrator/drawer for fruit and produce storage. The upper shelf level contains the temperature control setting unit, which does require careful adjustment for the right temperature control for cooling. There is not an open or closed freezer compartment with this particular model. The interior side door contains three curved integrated shelving units as well as an area to the side of the shelves for canned drinks. The bottom shelf is extended to hold larger bottles and other containers, while the other two shelves allow for storage of larger bottles, other containers, and eggs. Most importantly, the Danby is Energy Star compliant, which means it should save about $32 a year on utility costs, which will depend on local utility rates and actual use. The refrigerator does carry an 18-month warranty for functional parts, and it also comes with a User’s Guide and other information. Though small, this refrigerator holds a significant number of beverage containers and is a good size for use in a one-car garage and other small spaces, like dormitories, assisted living facilities, studio apartments, and motel/hotel rooms. With this particular model, watch for structural issues, possible noise, freezer malfunctioning, and the possibility of manual defrosting as well as limited air circulation within the unit. It may be necessary to utilize a cooling fan to adequately circulate the air. If you are looking for a small capacity garage refrigerator, this little and mighty Igloo Tool Box fridge may be a good choice, as it is situated on four caster wheels, which allow for mobility and easy change of placement in a small or large garage, and the wheels can be locked down for permanent positioning. This mini yet roomy metal and wire fridge has a 3.2 cubic feet capacity, measures 20 x 18 x 32 inches and weighs 48 pounds. The interior dimensions are approximately 22 inches high and 16 inches deep, and the bottom area is 10 inches deep. It does not contain an interior light. It looks like a toolchest! The fridge contains two shelves that are removable along with a crisper that maintains fruit and produce for a significant period of time. It has a small covered upper freezer area with a drip tray and a small ice cube container. There is no automatic ice maker. The temperature settings are at the right of the freezer area and are easily adjusted for adequate cooling of drinks and other items. It keeps drinks and other items extremely cold, even in the warmest of conditions, and the unit itself cools quickly from the initial plugin and startup. Its side door has a vertical plastic wired dispenser for at least 6 regular canned drinks and there are other storage indentations with protective wired closures for bottled drinks and cans. The very top of the side door has a barred storage area that allows for placement of at least 5 or 6 small bottles or canned drinks. The toolbox appearance is only for looks as there are no workable storage drawers. There are plastic strips across the front that appear like drawer handles. The fridge’s red color and style does blend in with other tools in a garage workspace and provide a convenient and camouflaged way to keep other hands out of the “food tools.” The unit has a 1-year limited warranty, and instructions and other information that accompany the refrigerator are limited. For a small refrigerator, which really is comparable to a Craftsman Tool Box, though not quite as red, there could be issues with the holes for insertion of the locking wheels. They are quite small and may have to be further drilled out for proper sizing. The lack of instructional materials is a little unnerving, but it is fairly easy to set up this fridge. The faux front drawers/handles are deceiving, but the rest of the refrigerator is attractive and fits in with a garage environment. Damage can occur through possible poor packaging and mishaps in shipping and handling, so it is important to report problems and keep the warranty handy for replacement purposes. While these don’t meet our “best” criteria, we are constantly on the lookout for refrigerators that will work in garage conditions, straight out of the box or with a garage kit. The following are runner’s Ups and might fit your exact requirements. All of the refrigerators reviewed here are easily adaptable to garage placement. Their exterior and interior sizing and their energy saving and cooling factors also make them flexible in a garage environment where temperatures can wildly fluctuate. They all can be utilized in and out of a garage and can handle different capacities and item numbers. There are a few drawbacks with temperature controls, but most of those hindrances can be overlooked because of the overall quality and efficient cooling factors involved with these three refrigerators. It doesn’t take much to find the best refrigerator for your garage. All it takes is a little time, effort and research and you are on your way to a cooler food and drink future. If you have any questions about getting a garage fridge let me know in the comments or send me a message. I’ll help as best I can.